Summer officially started here in US on June 23rd. And it's come with vengeance. As though someone left the oven on and forgot to switch it off up there!!! We have been on heat advisory for a while now, with temperatures reaching 100+ degree Fahrenheit. Highest till now has been record breaking 112. So we are celebrating the drinks. Which are so desirable and welcomed when the heat outside is just unbearable. It can be any kind of drink, shakes/ juices/ smoothies/ cocktails/ mock tails anything that you would want on a hot sunny day or cool summer evenings! Come on quench some thirst. ~ Linking back to this announcement page is mandatory to get the word out. ~ Usage of alcohol is allowed. ~ Blog post should be in month of July. ~ Two old posts are allowed, if re-posted again in July. ~ Non-bloggers can email the recipe along with a picture of the dish to the above email address. Hi, very nice event. will surely send my entry. Happy hosting. I linked in my entry, but its not visible. Pls let me know if you received my post. Lovely event Sumedha! Will link my entry soon..found your space while blog hopping. You have a lovely space dear..happy to follow you! hi sumee.. first time here and saw this event happening and i had jut posteda refreshing drink.. so linking it here... good event.. well required in the heat of dubai too..!!! Hi Sumedha, First time in your space, loved it.. I have linked my entry.. Happy hosting !! Do check my blog when you find time ! 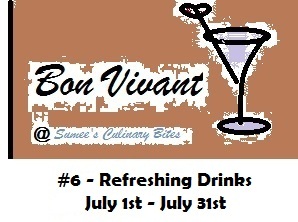 Have linked two of beverages to ur event. Happy hosting. i have changed teh URl and name of my blog.. hence deleted and relinked entrie..
renu's foodigest is now" its my spice"
Nice event...i just found your space. linked my recipe.